Lowering high cholesterol and triglyceride levels in the blood. It also increases high-density lipoprotein (HDL, "good") cholesterol levels. It is used along with an appropriate diet. It may also be used in combination with other cholesterol-lowering medicines. Fibricor is a lipid-lowering agent. It works by increasing a certain substance that helps to remove triglycerides from the blood. This also helps the body to decrease the amount of other bad cholesterol in the blood. Fibricor is a cholesterol-lowering fibrate medication that works to lower the amount of triglycerides and LDL (“bad”) cholesterol in the body, as well as increasing levels of HDL (“good”) cholesterol. Fibricor can be used in combination with statin medications to control LDL cholesterol in people at a high risk for heart disease. 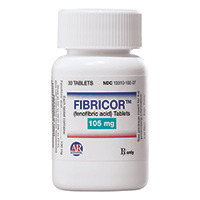 Fibricor helps reduce cholesterol and triglycerides (fatty acids) in the blood. High levels of these types of fat in the blood are associated with an increased risk of atherosclerosis (clogged arteries). Fibricor is used to treat high cholesterol and high triglyceride levels. It is sometimes given together with other cholesterol-lowering medications.